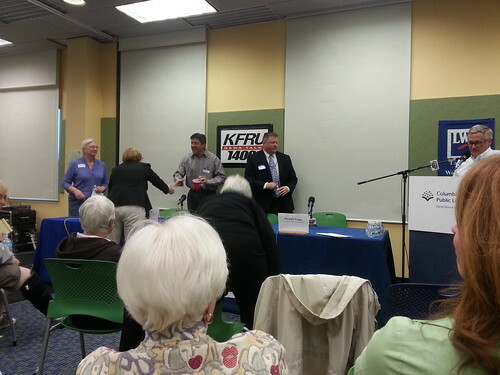 COLUMBIA, Mo 03/18/15 (Beat Byte) -- "I have never seen trust in our city staff and City Council at such low levels," former Columbia City Councilman Jim Loveless said at last night's League of Women Voters debate. "I agree 100% with my friend, Steve Spellman." Loveless' admission was the evening's Big Surprise, so compelling because -- as the new director of the Central Missouri Development Council (CMDC) -- he was arguing voters should pass Propositions 1 and 2, which would significantly raise rates for Columbia's city-owned electricity and stormwater utilities. Spellman spoke against the propositions, hammering the theme that dominated both the proposition and candidate debates: After a series of high-profile City Hall lies, deceits, and blunders, trust in city government is at historic lows. City government must rebuild trust BEFORE doing anything else. "Nobody believes what City Hall says anymore," Spellman, representing Boone County For Liberty, told the standing room only crowd. "If unseating a sitting City Council member [Ginny Chadwick] doesn't get our attention about the pressing need to rebuild trust, nothing will." Why should voters give more money to people they don't trust? Spellman asked. Why should voters re-elect Council members or School Board members they can't trust? 2nd Ward Council candidate Paul Love argued, in his bid to unseat incumbent Michael Trapp. The resounding answer to both questions: Voters shouldn't -- and didn't, as Columbia School Board candidate Christine King reminded. "When I first ran for this seat, I ran on a platform of transparency, which was at all-time lows," King said. "A superintendent [Phyllis Chase] had stepped down, and voters defeated a school tax levy, which is almost unheard of." The so-called "Trust Factor" became the 2-hour forum's main theme from the start, when Love made his opening statement. "I'm hearing about the 'trust factor' everywhere I go," he told the audience. Love decided to run, he explained, out of dissatisfaction with Councilman Trapp's support for "blighting sixty to ninety percent of Columbia for an Enhanced Enterprise Zone (EEZ) tax incentive." Blight is the second in a long list of trust-crushing policy measures that started with a 2011 move to gerrymander the First, Third, and Fourth Wards, peeling off their historically "progressive" City Council votes in favor of a new Town Boss-friendly Council majority. The downtown TIF; the Big Infrastructure Lie; the firing of Zim Schwartze; Ryan Ferguson; the Ginny Chadwick Recall; the Opus Debacle; the Dinner Train Failure; and the Sewer Billing Scandal have all followed during the McDavid-Matthes Administration. "I heard a Chamber of Commerce member say 'trust in city government may be permanently damaged,'" Love continued. "I heard people at a Visioning meeting talk about how they no longer have any trust in City Hall." "I could not agree more with Paul Love," Mr. Trapp agreed. "The Council has to work to restore trust." The Trust Factor also dominated the Sixth Ward debate. "There is a serious lack of trust as to how and where City Hall is spending our money," candidate Ryan Euliss explained. "There is certainly a trust factor with our city government," his opponent, Betsy Peters, agreed. Peters referenced Columbia city manager Mike Matthes' decision to hold "special" City Council hearings that violated city law to approve Opus and two other large, downtown student apartments. "We have to make sure we have public hearings when they are supposed to be held, rather than quick, extra ones," she said. "The Council needs to do what it says it will do. We need not to be lied to by our City Council."